American Renaissance can be more. That’s what we told ourselves last year. We wanted more readers, more articles, more outreach. We decided the internet was the best way to get there, so we put a stop on our monthly publication, which had been in print more than two decades. We hired a web designer to give our clunky, outdated website a facelift and increased functionality. Our efforts have borne fruit. This April we had 50 percent more unique visitors and 70 percent more page views than last April. A routine Google search for a phrase like “school sus­pensions” or “black crime” now often returns our website as one of the top results. By publishing high-quality original content online, our ideas and perspectives reach people who have never even heard of race realism. With social media, our readers can now “share” and “tweet” our articles to friends and colleagues, greatly increasing our reach. Best of all, readers are now able to leave comments, instantly adding information and perspective. This year, we also ventured into the world of video production, making informative videos on subjects like white identity, diversity, and the biological reality of race. Each video has received thousands of views and hundreds of comments. Our most recent video on the Trayvon Martin shooting has been viewed 26,000 times—and counting! We’re proud of what we’ve accomplished, but since our content is now completely free, we rely entirely on donations to continue our work. Of course, our efforts extend beyond the internet. 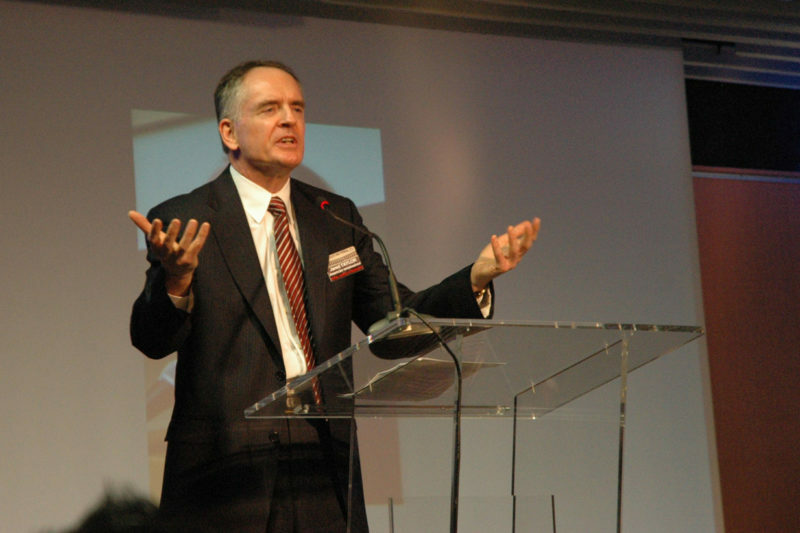 This March, Jared Taylor spoke to a gathering of more than 750 nationalists in Paris. He shared the stage with a prominent magazine editor, a former high-ranking government official, and the leader of the Vlaams Belang. He was humbled to receive a standing ovation. Later that month, more than 150 AR supporters gathered in Nashville, TN, for our first full-scale conference since 2008. We held the conference at a state park, so the facil­ity was governed by the First Amendment, unlike the private hotels that buckled under political pressure in 2010 and 2011. The weekend was a great success, and we plan to go back to Nashville next year to host another conference. On the publishing front, we are in the second printing of Jared Taylor’s White Identity, which continues to sell well on Amazon.com and our web store. We have also begun selling racialist classics, such as Madison Grant’s The Conquest of a Continent and Lothrop Stoddard’s The Rising Tide of Color. Our work would not be possible without the support of people like you. The scope of racial discourse is narrowing. Recently National Review cut off contributors John Derbyshire and Robert Weissberg because they expressed honest views on race (Dr. Weissberg committed the sin of speaking at our March conference). This means our efforts are more necessary than ever. But as you know, our work requires money, and we can do much more with your help. We want to publish an updated version of The Color of Crime, the definitive report on race and crime. The 2005 edition is still regularly cited by mainstream sources, but it is now seven years old. We want to complete our video series so anyone with Internet access can get a full race-realist education from just a few hours of video. We have been publishing original content every week but we must do more. We would like to commission regu­lar blog contributors who could investigate stories and offer instant commentary on current events. We want to host a bigger and better conference in 2013 but still offer an affordable rate for attendees. But we can do these things only with your help. That’s why I’m asking you to make a tax-deductible con¬tribution in the name of our race and civilization. says discrimination against whites is just as big a problem as discrimination against non-whites. Young people are waking up. And with your help, we will shake them up. We don’t know how much you can afford, but if you can give just $50, $25, or even $10, we will put it straight to work. A gift of $1,000, $5,000, or even more will help fund the new programs we would love to start. If you can contribute $1,000 or more, we will send you one of only 100 hand-numbered, hardbound copies of Jared Taylor’s new book, White identity, which he will inscribe to you with much gratitude. Only 100 copies of this special edition will ever be printed, so act soon. You can also support us by making an automatic monthly donation. Your commitment to donate $10 or $20 each month helps us continue providing a forum for honest and insightful views about race. The odds we face are daunting, but we must do everything we can to build an America we would be proud to leave to our descendants. Every day, anti-white organizations’ bank accounts continue to grow. We can counter them—the truth is on our side—but we need your financial support. We will give you our best—if you give us the means. PS: With your support we can fight in defense of our race, culture, and civilization. Without you we can do nothing. Please act today.